Been receiving your blog for about 10 months now, & I love it. I’m in New York City. My late husband was English & a Londoner and highly knowledgable about London before the blitz. He would have loved your blog, too. Wonderful pictures. Sorry to be picky but I think the picture of the Palace of Westminster is the wrong way round. Or am I the wrong way round? Puzzled by this one, even when it is not flipped! Where are the Victoria Tower Gardens? ‘Victoria Tower Gardens were created in 1864-70, following the embankment of the Thames … although Sir Christopher Wren had conceived of a continuous embankment in 1666′. 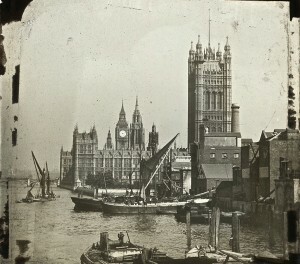 Is there any photo of that period of Queenhithe? I think you’ll find the this photograph has been printed back to front?